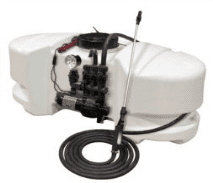 Fimco 55 and 110 litre Pro Packs are great for spray jobs around the farm or home. 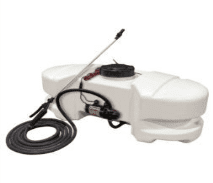 Fitted with a 8 litre per minute pump and professional pistol grip hand gun the propack is ideal for spot spraying or running a small boom. Pro Packs and fitted with a manifold and pressure guage. The manifold allows pressure adjustment with excess flow being directed back to the tank for agitation. An additional outlet is provided allowing the addition of a a second gun or boom. • Pressure control manifold and pressure gauge for pressure adjustment for applications such as a boom spraying. • 45 cm deluxe pistol grip handgun with adjustable tip.